Here is the most in-depth study ever written on the correlation of well-defined historical cycles in the U.S. stock market to longer-term planetary cycles. The results are truly remarkable and will change the way you look at financial markets. 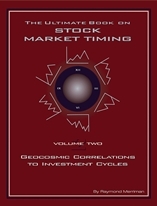 With this book, the reader will discover which geocosmic signatures have phenomenal correlation to the 18-year cycle tops and bottoms, and which have a greater correlation to intermediate-term cycles, like the 50-week cycle. But it doesn't end there. A well-thought out methodology is presented on how to apply these market timing techniques to identify optimal times for making long-term investments in the U.S. stock market. This is a book that will be of great value to investors for many, many years. It is well-written, and along with Volume 1, is destined to become the ultimate reference book on stock market timing. This is a book that correlates all geocosmic signatures involving major aspect relationships between Jupiter, Saturn, Uranus, Neptune, and Pluto, to the intermediate and longer-term cycles in the US stock market. Intermediate cycles involve those that last 1-2 years. Longer-term cycles relate to those of the 4-year or greater types. The book was originally written in 1999. This will be the first update, and it will calculate new values for all these cycles. It will include the cycles that have unfolded between 1999 and early 2012. For investors or longer-term position traders, this book is invaluable. Special attention will be given to the Uranus-Pluto aspects since the late 1600's (British stock market data).